Linn's Lingerie understand that many lingerie brands can be very different in their sizing. One brands size can be completely different when compared to another brand. To the bottom right of the product page, you will see a colour drop down menu (Select Your Colour) and a size drop down menu (Select Your Size). 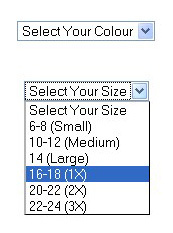 You'll notice that Linn's Lingerie now have detailed numerical bust or dress sizing next every size. We have made sure that every individual product has been sized according to it's manufacturer.